St. Patrick’s Day madness is right around the corner and once again partygoers donning their best green attire have a slew of Irish options to choose from. 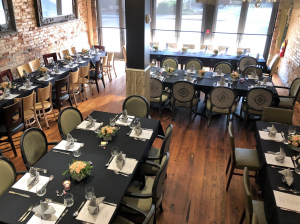 A chef-driven dining destination located in historic downtown Winder, Georgia, Bistro Off Broad is hosting a special Irish dinner created by Executive Chef Alex Friedman on Thursday, March 14, 2019 before the official St. Patrick’s Day weekend festivities begin. Serving fresh, local, and affordable  cuisine along with impressive wine and spirits in a casually chic, historic setting, Bistro Off Broad will be offering a buffet of Irish specials including: Corned Beef and Cabbage; Irish Stew – Beef and Guinness Stew; Bangers and Mash – Grilled Sausage and Mashed Potatoes; Shepard’s Pie – Ground Lamb and Potato Pie; Baked Cod with Parsley Sauce; Chips with Curry Sauce; Cider Glazed Carrots; Mushy Peas – Mashed Green Peas; Colcannon – Mashed Potato with Kale and Scallions; Irish Soda Bread; Carved Rosemary and Garlic Leg of Lamb; and specialty Irish Coffee Gelato and Guinness Cake. Imbibers looking to celebrate to the fullest can sip on $4 Guiness Draught cans, $5 Oconee Brewing Company drafts, $7 glasses and $28 bottles of R. Stuart & Co. Winery Big Fire Pinot Gris and Skyfall Vineryard Merlot, $3.50 Jameson shots, $10 Irish Manhattans, and $9 Nutty Irishman cocktails. Bistro Off Broad’s Irish Feast will take place from 5 p.m. to 9 p.m. and is available for $30 per person. Reservations are recommended. Bistro Off Broad is located at 16 E  Candler St, Winder, GA 30680. To make a reservation, email BistroBroad@outlook.com or call 678.963.5517. For more information, visit  www.bistrooffbroad.com. Partygoers looking for a little luck of the Irish can make their way to Park Tavern in Piedmont Park for the Irish Lights Festival with Lost Kings presented by A Social Mess on Saturday, March 16, 2019. Taking St. Patrick’s Day to the next level, Park Tavern and a A Social Mess will be illuminating the city and with national headliner Lost Kings along with a host of DJ’s spinning EDM all night long. 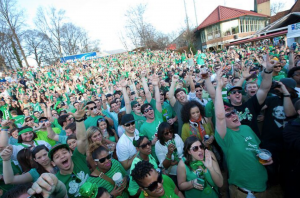 Beginning at 2 p.m., patrons can gather in the heart of Midtown to light Atlanta green during an unforgettable, all-day party in celebration of all things Irish. For ages 21 and up, General Admission tickets are available beginning at $23 and include entry to the event and entertainment for the day. VIP tickets are available beginning at $100 and include standing room access to stage front viewing, indoor bathrooms, private bartenders, outdoor spring garden seating, and early admission to a hosted VIP party in the VIP lounge from 2 p.m. to 3 p.m. For updates on ticketing information, please visit www.bigtickets.com/events/asocialmess/irish-lights-festival-st-patricks-day-mar-16-2019. This event is rain or shine and tickets are non-refundable. For more information, visit www.parktavern.com or call 404.249.0001. Park Tavern is located at 500 10th Street NE, at the corner of 10th and Monroe, Atlanta, Ga 30309. Stay connected on Facebook, Instagram, and Twitter @parktavern. Ready to drink like the Irish? 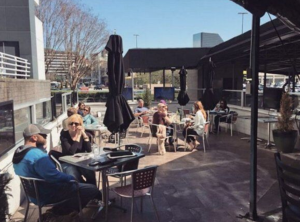 It’s no coincidence that The Barrelhouse, located in the Old Fourth Ward, is hosting a special party for those looking to make the most of a Sunday Funday on St. Patrick’s Day, Sunday, March 17, 2019. 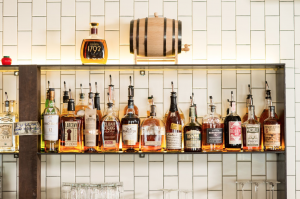 A neighborhood corner pub that prides itself on being everyone’s “living room” and just a short walk from the BeltLine, The Barrelhouse is an ideal place for Atlantans and visitors alike to grab a bite and enjoy a wide selection of libations from craft brews to classic cocktails. This St. Patrick’s Day is no different. Imbibers can visit The Barrelhouse for food specials including: Bangers and Mash, Corn Beef and Cabbage, along with $4 Guinness, $3 Irish Whiskey Shooters, $3 Jell-O Shots, specialty cocktails and more. For more information, visit  www.barrelhouseatl.com or call (404)-600-5251. The Barrelhouse is located at 701 Highland Avenue, NE Suite 5 Atlanta, GA 30312. Stay connected on Twitter at @Barrelhouse_ATL, Instagram at @Barrelhouse_o4w and on Facebook at  @BarrelhouseATL. Dantanna’s is celebrating the luck of the Irish with a mouth-watering dinner offering at both locations, Dantanna’s Buckhead and Dantanna’s Downtown. On Sunday, March 17th, diners can sink their teeth into a traditional St. Patrick’s Day Corned Beef & Cabbage — corned beef brisket, cabbage, boiled red potatoes, jalapeño-dijon and grain mustard hollandaise sauce, and wash it down with a Guinness and Bushmills drink combo. In addition to the St. Patrick’s Day specials, guests can also take advantage of Dantanna’s full dinner menu and extensive wine, cocktail and beer list. Dantanna’s Buckhead is located at the Shops Around Lenox, 3400 Around Lenox Rd NE #304, Atlanta, GA 30326. Dantanna’s Downtown is located at 1 CNN Center #269, Atlanta, GA 30303. For more information visit www.dantannas.com or call 404.760.8873 for Dantanna’s Buckhead or 404.522.8873 for Dantanna’s Downtown. Stay connected on Twitter and Instagram at @dantannas.